You will always be treated with integrity, courtesy and openness in everything we do for and with you. You will receive proactive advice that adds value to your business and financial situation. Your affairs will always be treated with absolute confidentiality. Your telephone calls will be returned within one day. Your deadlines will always be met, (unless unusually, for reasons outside of our control we are prevented from doing so, in which case we will let you know well in advance). We strive to provide the very best quality of service. Throughout the year we ask our clients for feedback on our performance. 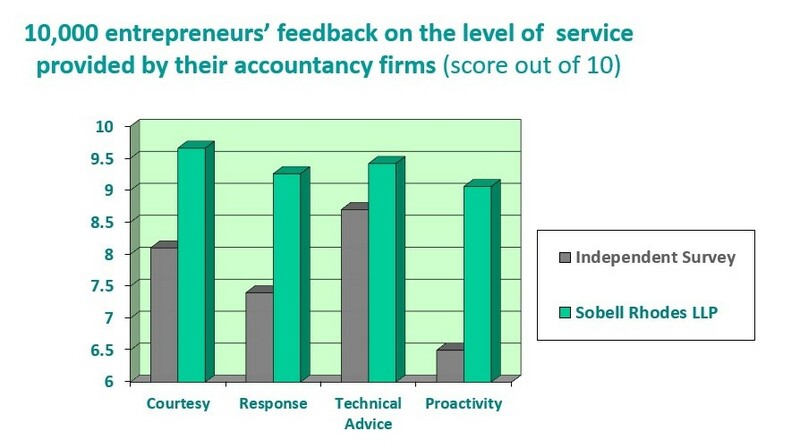 Then we compare our client service questionnaire results with independent surveys from over 10,000 businesses about their accountants. The chart below illustrates in the last year how we compare to other accounting firms in the following areas of client satisfaction.